Take a look at this first quadrant. 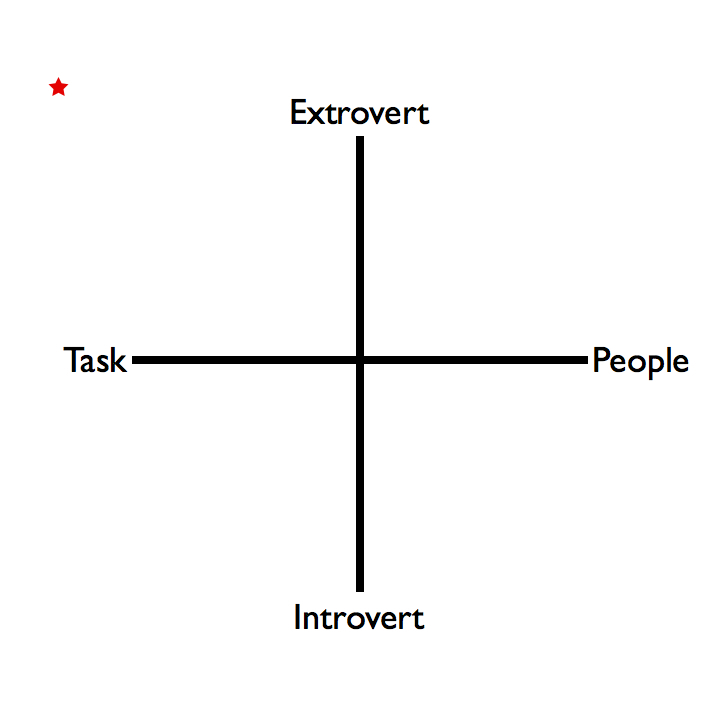 You will see that there are two axis: Task vs People orientation, and Introvert vs. Extrovert orientation. This is pretty self-explanatory, but very briefly, task oriented personalities tend to be goal-oriented and strive to achieve based on rational, logical and factual thoughts. People oriented personalities, on the other hand, tend to be concerned with the people performing the tasks and are more concerned with nurturing, cheer-leading and encouraging. The differences between these two personality types are the source of lots of conflicts. Now look at the next quadrant. The red star represents where I fall on the spectrum. It doesn’t get much “worse” than that (I say only slightly joking). I’m so task oriented that even the task oriented people think I’m insensitive. To make matters worse, based on the introvert/extrovert axis, I’m not shy about it. With that understanding, let’s come back to the point of this article. As an extremely task oriented person I valued efficiency, competence, and logical synthesis of the data involved in any decision. In my early stages of growing as a leader, it seemed natural to me that people would value my leadership based on my ability to demonstrate those qualities. I was “really good” at what I did (read “tasks”) and knew a lot about my field (read “data”) so I’m good, right? Wrong! It’s important that I make one thing very clear. I am not an uncaring person. I love people deeply. The issue wasn’t whether I was an uncaring, insensitive jerk. The issue was whether people could tell that I wasn’t an uncaring, insensitive jerk. To grow as a leader, I had to focus on relationships and making sure that people felt valued. I had to be purposeful in my interactions. I went through a difficult period of “conscious competence” with respect to interactions with others. Today, I have come a long way, but I will never be able to let me guard down. Exhibiting my care for people and value for people will never be my natural instinct. But I have come to understand that without taking that step, I am going nowhere as a leader. If you are People oriented, this is second nature to you. If you are Task oriented like me, I challenge you to focus on this area. Answer these questions as a good start. If I were to interview the 10 people closest to you, when was the last time you made them feel valued? How? How often do you connect with people in your sphere of influence completely separate from any task or objective? List your 5 most important relationships. What could you do to demonstrate how much you care in the next 48 hours? Do it.